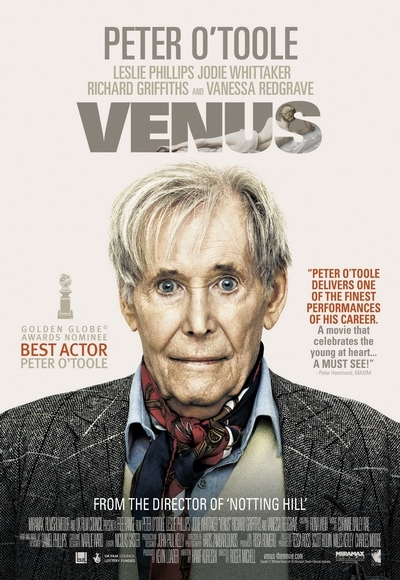 Story: "Venus" tells the story of Maurice and Ian, a pair of veteran actors (Peter O'Toole and Leslie Phillips respectively), who never quite hit the big time. Now in their 'golden years', they continue to work, though the jobs are far from glamorous. But their comfortable routine and witty banter over breakfast in a favorite cafe is disrupted by the arrival of Ian's grand-niece, Jessie (newcomer Jodie Whittaker). Jessie quickly tries her great-uncle's patience; but Maurice is absolutely taken with the young woman and proceeds to show her the cultural sights of London. As Maurice tries to give Jessie the benefit of his experience, he is surprised to discover how very little he actually knows about himself now that his life is drawing to a close. Jessie, who had arrived with an enormous chip on her shoulders, slowly learns from Maurice the value of respect - for herself as well as others. The film also stars Richard Griffiths and Vanessa Redgrave.